Top 5 DJ Software: Options for Digital DJs. In this video, Skrillex is seen performing a radio mix with Diplo. If you look very closely at 0:12, you can see one of the signature virtual turntables on the Macbook Pro screen. Diplo is seen performing a 0:12, However since Skrillex is seen using the same equipment at 0:28, It's Implied that he's using Serato DJ. There are several photos of Dada Life seen with MacBook running on Serato DJ/Scratch Live. This tweet by Diplo indicates he uses Serato DJ software to perform his live sets. He says, "Jus cheked my serato playlist..."
"lol I was telling my friend earlier WATCH THIS AMA WILL BE ALL QUESTIONS ABOUT SERATO & TRAKTOR… I really like both platforms. I'm digging Serato's new DJ software so I wanted to mess with it. Traktor is really powerful, one of the few letdowns is the file management, you kind of have 2 libraries. So right now I'm enjoying the ease of Serato. But I could use both." 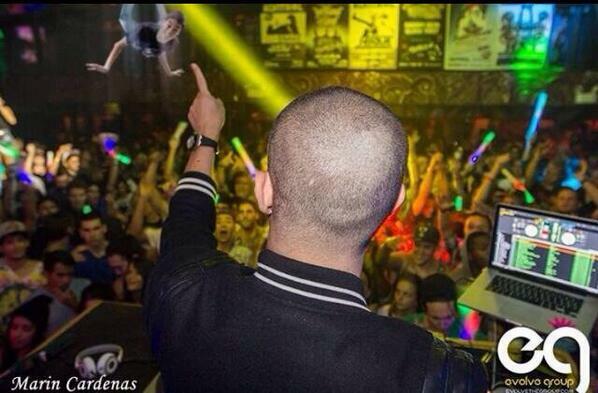 In this bizarre photo of DJ Snake, we see Serato DJ running in two-deck format on his screen. DJ Snake himself posted this photo on his own Twitter, with the caption "I see you". In the right of the photo, you can see DVBBS' laptop running Serato DJ. In Case & Point's Facebook photo, Serato DJ can be seen on their laptop screen. Throughout this video, Joachim Garraud demonstrates his use of the Serato DJ software in his live shows. At 7:59 he demonstrates how to hot cue notes to trigger video clips in Serato. "I used Serato as a way of holding onto the decks, and just flip a switch and bypass the Serato between the tracking record and the next track, and then little by little all the tunes I was listening too were getting released on digital as the record companies stopped making vinyl and clubs stop providing decks only digital..."
You can see Kygo using Serato DJ on his macbook pro. In this video you can see Serato DJ on the laptop screen at 1.31. At 0:44 you can see it open on his laptop. You can see that he's using serato on a macbook pro. In this instagram video, shot in Moscow, he is using a MacBook Pro, running Serato. At the minute 1:53 we can see he runs on his Mac Serato Dj. In this video you can see that he has his turntables set up with serato. Zegon uses serato as main mixing software, while lauz ableton live. This Software can be seen at 0:01 in this Instagram video, uploaded by the artists themselves. Their DJ's using Serato as posted on Facebook. Serato DJ Software can be seen in multiple shots in this Instagram picture, uploaded by Jerome Price himself. "Today I went back to basics .. to how I started programming, this time with the help of some of the software available since I last spun records out. Can't believe it took me this long." In the photo we can see he is using Serato DJ. In this Instagram photo, Jax Jones is using the DJ Software by Serato. He said on a Periscope that he used Serato Dj software for dj setup and mix. You Can See THE GM Uses The Serato Dj Software In His Instagram Post Showing His Dj Setup. Serato hat über mehrere Monate einen ausführlichen Beta Test durchgeführt, um alle Fehler aus der neuen Version auszumerzen. Die neue Version Serato DJ Pro macht einen ausgereiften Eindruck. Ein Höhepunkt ist sicherlich die deutlich verbesserte grafische Oberfläche. Sie unterstützt jetzt auch hochauflösende Bildschirme wie 4K oder Retina-Displays. Eine Wonne, damit zu arbeiten. Sie ist wesentlich besser lesbar ist, sieht schicker aus und geht mit weiteren Verbesserungen einher. So haben die Performance Pads am Bildschirm ein neues Layout bekommen, ähnlich dem der meisten Controller. Unter der Haube arbeitet Serato DJ Pro jetzt im 64bit Modus und nutzt damit die Möglichkeiten der modernen Betriebssysteme wie Windows 10 oder macOS aus. Dadurch gibt es keine Einschränkungen mehr bei der Größe der Musiksammlung. Auch das Suchen nach und Laden von Tracks, gerade in großen Sammlungen, soll jetzt schneller von der Hand gehen. Richtig feiere ich aber den neuen Practice-Modus. Endlich beherrscht Serato DJ Pro nicht mehr nur einen Ein-Deck-Modus, sondern nun auch zwei Decks. Dazu gibt es die Möglichkeit das Tempo anzupassen, einen Crossfader, die Sync-Buttons sowie Cues & Loops. Selbst Flip und Video lassen sich nutzen. So ist es möglich, mit Serato DJ Pro auch ohne angeschlossenen Hardware Übergänge auszuprobieren. Auch die kostenlose Testversion hat so endlich wirklich Sinn, da sich nun vor dem Kauf einer Hardware ausprobieren lässt, wie gut einem Serato DJ Pro zum Arbeiten als DJ zusagt. We’ve combined state of the art features with the world’s best hardware manufacturers to bring you Serato DJ. The industry leader for high?quality, innovative, and reliable software. Serato DJ is Plug and Play with official hardware, just connect by USB and start mixing. Download the latest version of Serato DJ now and try it out for free. DJs need software they can depend on. We know that better than anyone. It’s why stability has always been a driving force behind our products, along with a dedicated customer support team to help you when you need it. It’s also why Serato is the first choice for the world’s top touring and club DJs. Mix, blend and scratch your tracks at the touch of a record or platter. Manipulate your music with up to 8 saved cue points and loops per track. You can lock your tracks in time with easy to use Sync options, or turn Sync off and never see it again. Seamless integration with Pulselocker, iTunes and our crate storage system mean it’s easy to keep your library organized and intuitive. Analyze your music to detect the BPM and Key information. Use the history panel to save your best combos and export playlists for your followers. Stream tracks direct from Pulselocker or store them on your device for offline play. All the important track information you need is displayed on our famous virtual decks. Get live BPM and track time information as well as visual representation of upcoming cue points and playhead position while scratching. Visualize your tracks with our unique EQ colored waveforms. Red for bass, blue for treble and green for mid-range. Never miss an incoming vocal or bass drop. Keep your tracks in time with a simple beat matching display next to our waveforms. Use club standard setups with Serato Control Vinyl or CDs for the perfect emulation of real feel DJing. For turntablists there is the unique sticker lock feature to keep your routines super tight. Record your full sets in customizable high quality formats, ready to share with your followers online. Trigger DJ stings, loops, acapellas, drops and whole tracks from the Serato Sampler. Keep up to 32 samples loaded across 4 banks and sync them with your playing tracks. Add ready-mapped official accessories to your setup. Alternatively connect any MIDI device, or remap your primary device however you like to personalise your performances and increase your productivity. A huge array of customizable DJ FX powered by industry leaders iZotope. From the DJ necessities of Filters, Echoes, and Delays to complex and creative noise synths, dubbed out tape echoes and retro 8-bit audio bending FX. I make decisions based on what makes a crowd go f*ing crazy; so the things I do, make the crowd go f*ing crazy. It is all about rocking the party with skills & the right tracks. High energy music & all kinds of technical tricks from scratching to hitting drum pads. That is what I want to deliver in my sets and enjoy the crowd. I don’t care why you know me… once I get you in that building my job is to convert you to a fan. Expand the feature set and quality of your performance by adding expansion packs. Choose from extra FX packs powered by iZotope. The ability to create edits with Serato Flip or add visuals and karaoke with Serato Video. Add Pitch ‘n Time DJ for the best keylock in the industry and key shifting features then control it all remotely with Serato Remote. Here at Serato HQ we are always creating content to help DJ's discover new features and hardware. Learn about interesting ways to use Serato DJ that you haven't tried before. Find out if new hardware is the right fit for your workflow. Listen to staff who helped work on features talk about creative ways to use them. Suitable for all skill levels. Our dedicated customer support team is available to assist you when you need it. Have questions about the software or hardware? license issues? Need advice and want to chat to a like-minded professional? Our team is here to help. Browse the vast library of helpful support articles and videos for instant access to setup and optimization guides. Personally I'm not much of a Serato guy but when I was using it, it was really easy to learn. It's an amazing piece of software. Easy to use and by far my favorite DJ software that i use with my Pioneer DDJ-SZ!!! Very intuitive, clear HUD, flexible - no-problem software. A very good and colorful interface. Easy to find what your looking for.